Signs that spring has officially sprung: the sun is setting later, flowers are in bloom, and color authority Pantone has announced this season’s most prominent color trends. This spring’s hottest hues are made up of joyful, empowering colors – believed to exude uplifting creative energy and confidence. “Colors this season transport us to a happier, sunnier place,” says Leatrice Eiseman, executive director of the Pantone Color Institute. 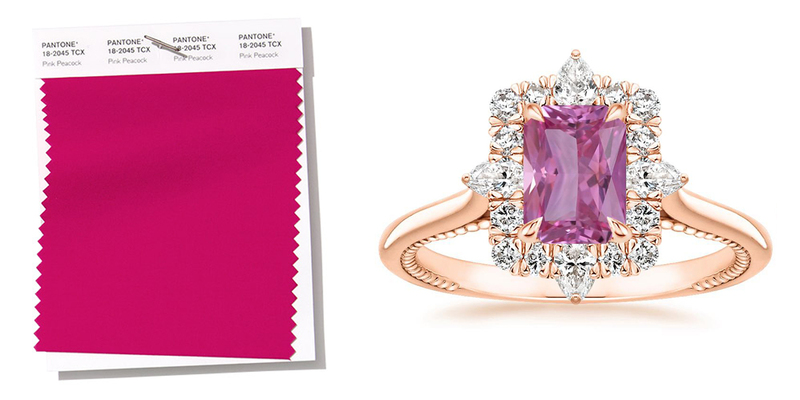 Discover a few of our favorite colored gemstone pieces inspired by Pantone’s beautifully seasonal color palette below! 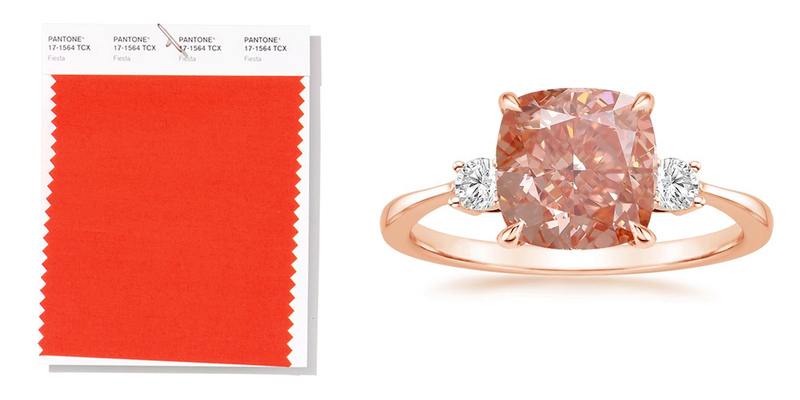 An affable and enlivening coral hue with a golden edge, Pantone’s color of the year finds its gemstone equivalent in the peach sapphire. 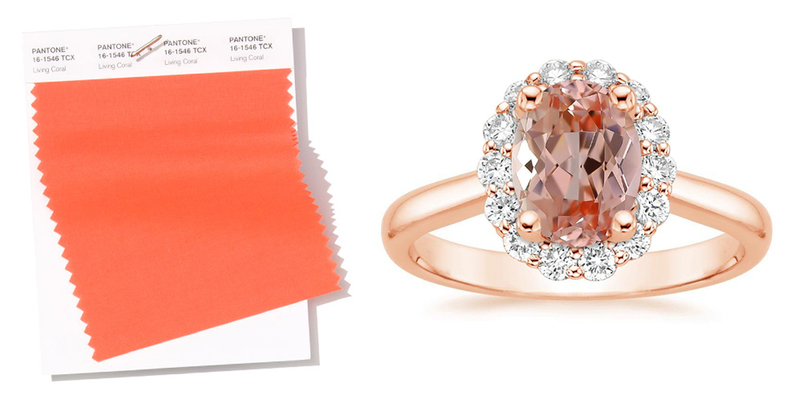 Pantone describes Living Coral as a color of carefree happiness, symbolizing our “innate need for optimism and joyful pursuits.” We love how peach sapphires complement the warm tones of rose gold engagement ring settings. 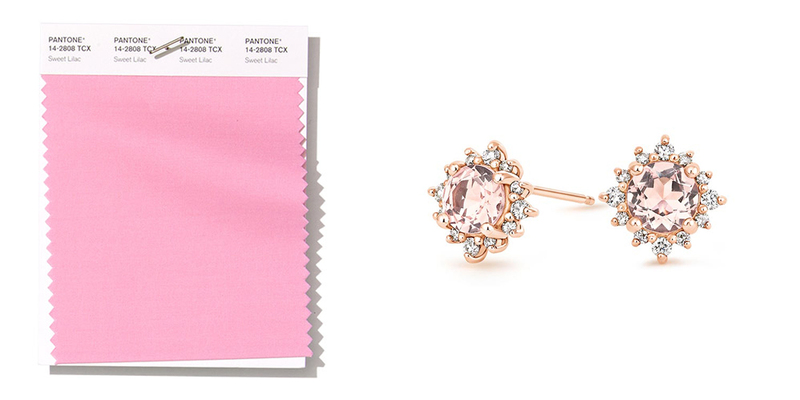 An endearing pink infused lavender with an undeniably feminine flair, Sweet Lilac embodies the morganite gemstone. 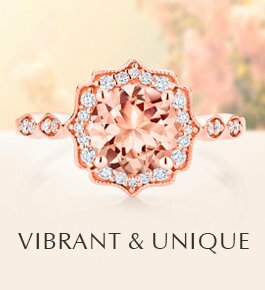 With its gentle pink energy, morganite is commonly associated with the Heart Chakra—believed to help cleanse anxiety and inspire lightness within the spirit. 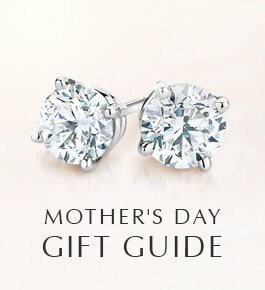 We love how the glittering diamond halo design of our Morganite Sol Earrings captures this lightness—reminiscent of sunshiny days. Aspen Gold is a warm and happy color, sure to brighten your day. Evocative of good cheer and sunshine, this joyful hue beams from our breathtaking selection of natural and lab created yellow diamonds. 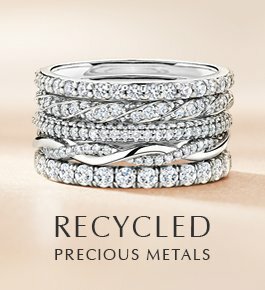 Pair it with a yellow gold engagement ring setting to complete the look! A lush, natural green that exhibits nature’s brilliance and mystery, Pepper Stem gives off a soft and serene energy. 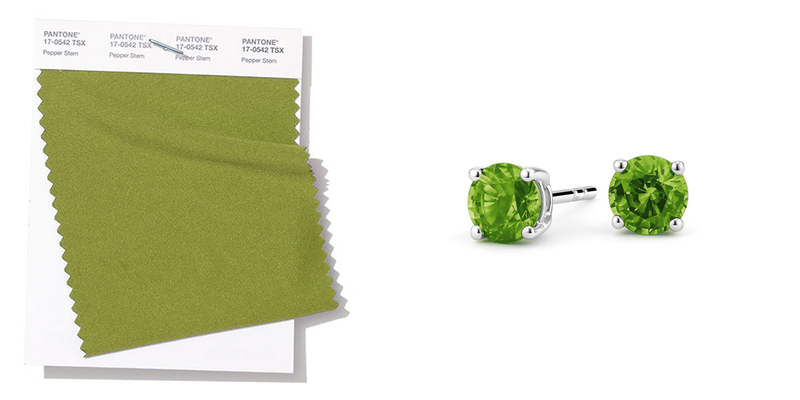 This season, we’re wearing this striking color in the form of our Peridot Stud Earrings to reestablish our connection with nature. Described as refreshing and emblematic of flourishing foliage, Terrarium Moss’ yellow-green shade is mimicked in teal sapphires. 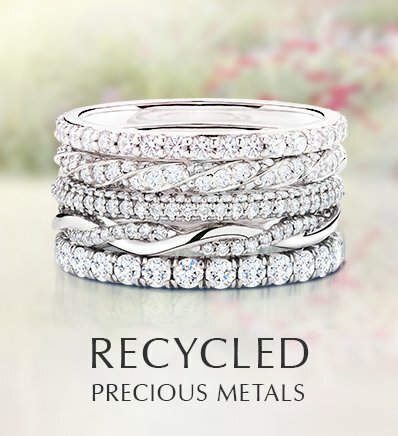 Inspired by the beauty of the natural world, this shade pairs perfectly with one of our nature inspired designs. 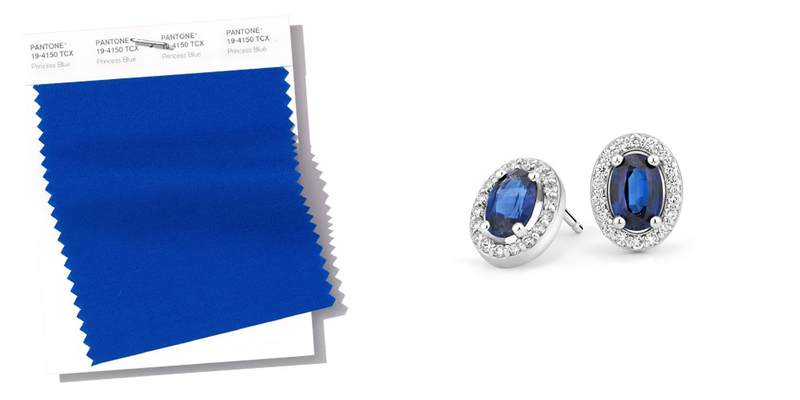 Conveying energy and confidence, Pantone’s Princess Blue is imbued with inner radiance. This striking shade can be found dazzling between a halo of diamonds in these Sapphire Halo Diamond Earrings. 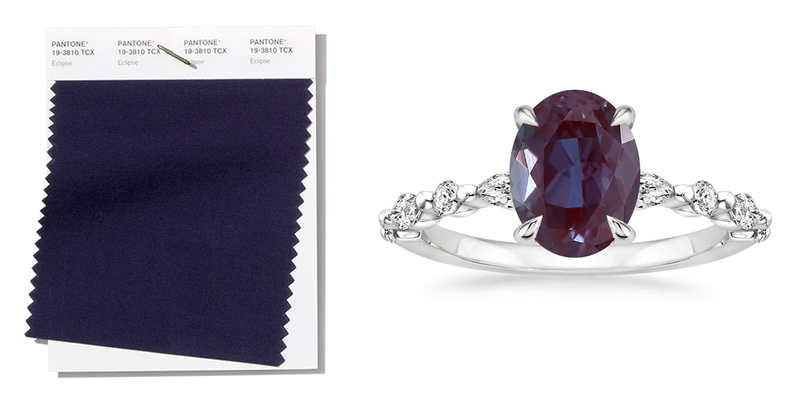 Described as a dark mysterious hue, emblematic of the night sky, Eclipse can be seen in the Alexandrite gemstone. 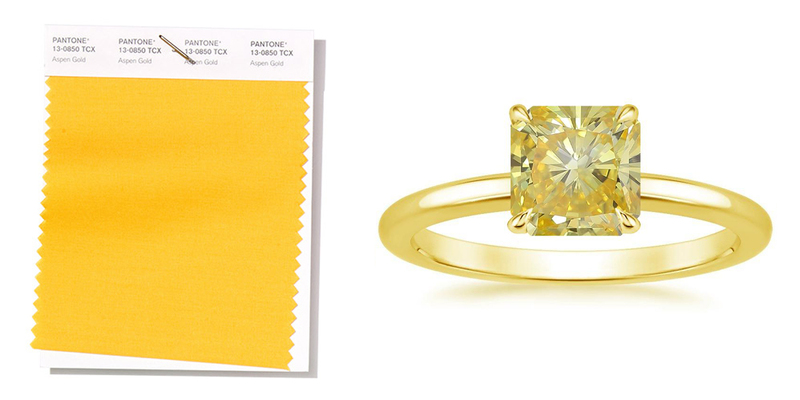 We love how this bold shade contrasts with a diamond accented band. 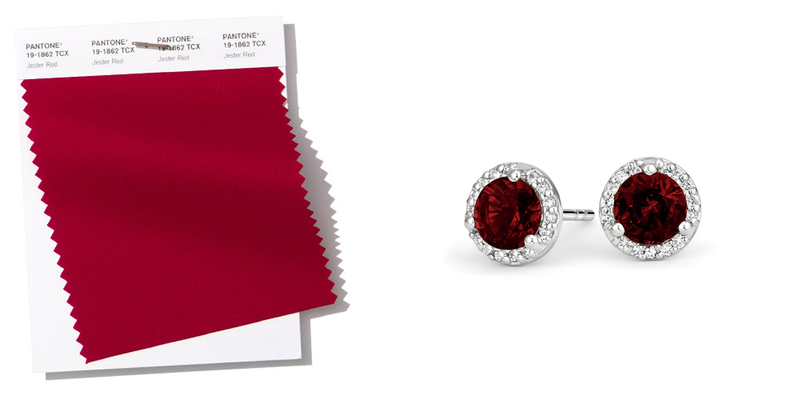 Much like the garnet gemstone, Jester Red radiates royalty. Adding depth and sophistication, these mesmerizing garnet halo diamond earrings surely capture the imagination. 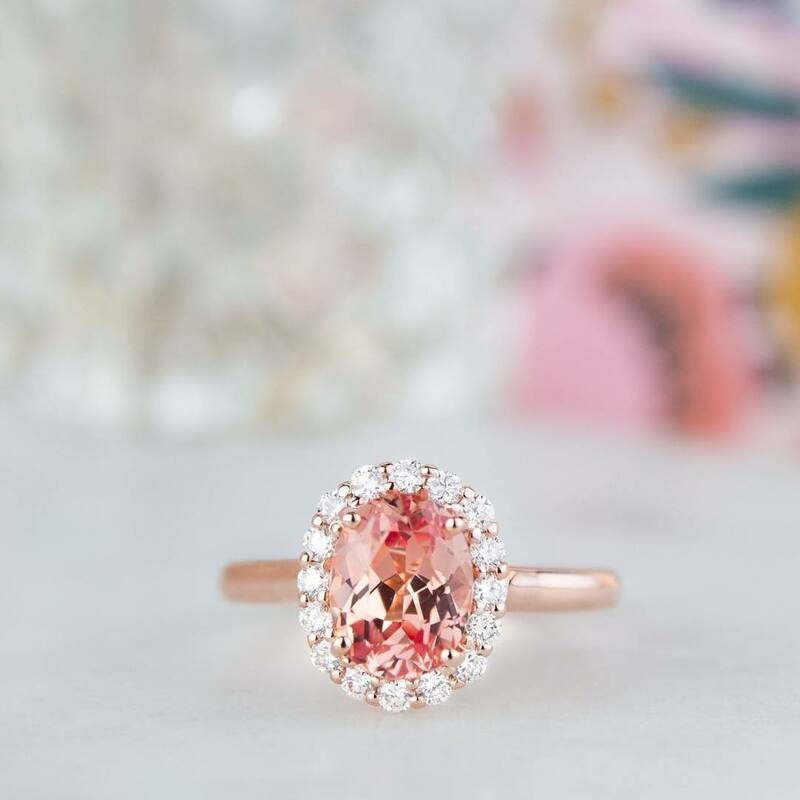 The tantalizing Pink Peacock steals the show with this rose gold pink sapphire engagement ring. Following in Lady Gaga’s footsteps, pink engagement rings are becoming more popular than ever! 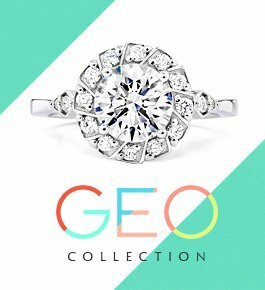 In this particular ring, a halo of round and pear-shaped diamonds fan out to mimic this Pantone hue’s theatrical qualities. As exciting as its name suggests, this vibrant red-orange hue captures the optimism of spring flowers blooming after a long winter. Fiesta finds its gemstone equivalent in the pink diamond – adding just the right amount fiery heat to get the party started! Pantone’s Mango Mojito is comforting and beautiful, evoking an inherent warmth. 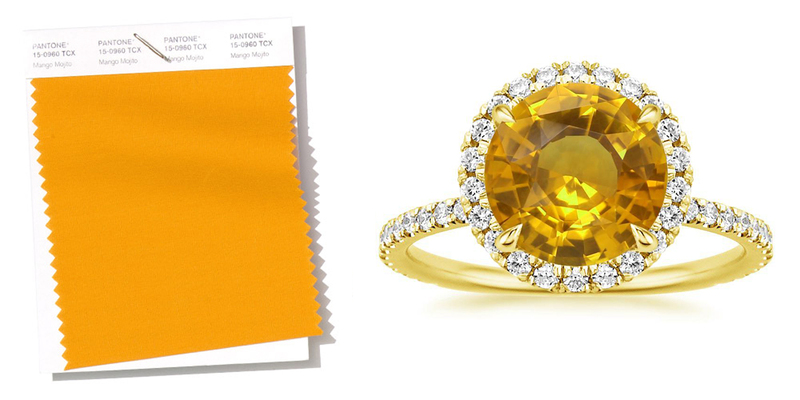 This yellow-orange hue finds its gemstone equivalent in the dazzling yellow sapphire. 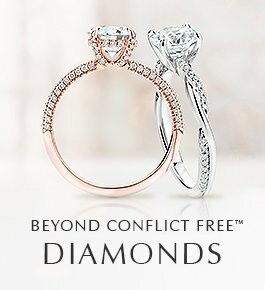 Complete the look with one of our sparkling halo designs for something surely reminiscent of sunny skies and happy days. A key neutral for this season and beyond, Sweet Corn’s earthy color effortlessly bridges the seasons for a look that’s always in. 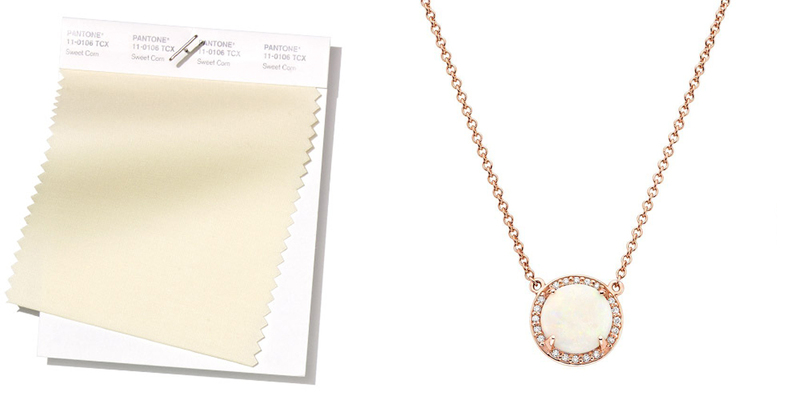 For something this effortless and versatile, we’ve opted for an opal pendant necklace—a timeless compliment for any look. 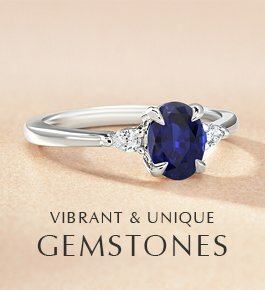 This soft pale gemstone gives off a healthy glow and tranquil aura, perfect for spring. 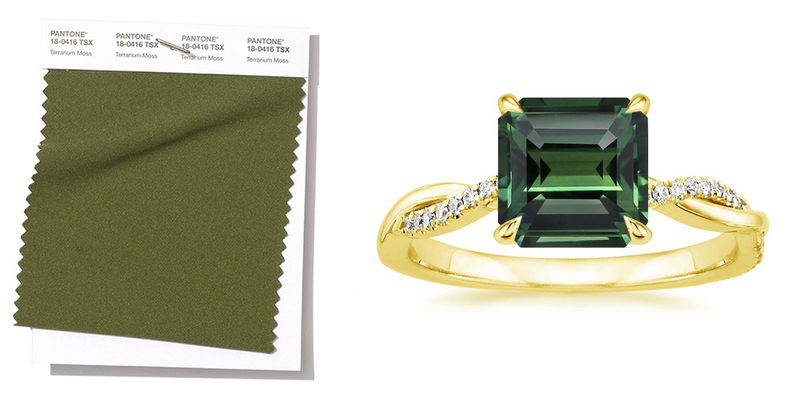 What do you think of this year’s spring/summer color trends? 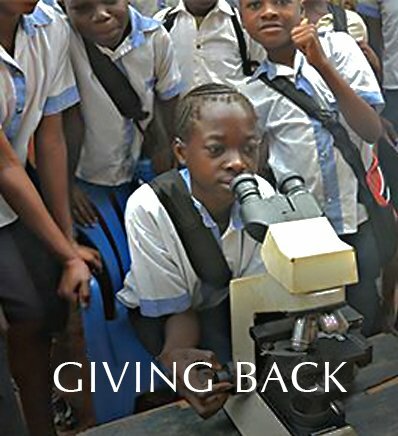 Let us know on Instagram, Facebook or Twitter, or in the comments section below!